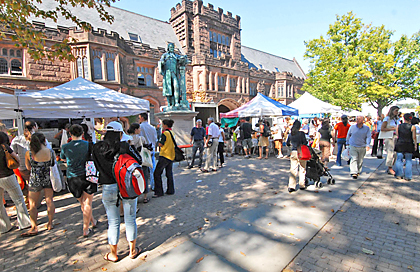 MARKET DAY ON CAMPUS: A farmers market gave a new look to Princeton University's Firestone Plaza Tuesday while former president John Witherspoon (1768-1794) watched over the sunny scene. Open from 11 a.m. to 3 p.m. every Tuesday through October 23, the market is an initiative of the Greening Dining Group, a partnership between the University's Department of Dining Services and Greening Princeton, a student organization. New Jersey voters will not receive a printed record of their vote in the February 2008 primary elections, the state Attorney General Anne Milgram announced this month, leaving some leaders of the fight to implement a paper voting record worrying that a paper trail may not exist for the 2008 general elections as well. In April of this year, the Princeton area was effectively shut down when a nor’easter dumped over five inches of rain over a 48-hour period. Schools were closed, shops were closed, and streets were gridlocked. Heartland Payment Systems, which provides retailers with the tools for processing credit card transactions, proposed a pilot program to the board of trustees of the Princeton Public Library last week. For 37 years, the Whole Earth Center has espoused the kind of healthy, wholesome wisdom that you might expect to hear from some not-for-profit, environmentally conscious, organization, but certainly not from a local grocer. Police arrested two men who were allegedly engaged in a sexual act on an open trail in Herrontown Woods Park in Princeton Township last week, as the park falls under increased surveillance by plain clothes patrol officers. Just weeks after a handful of concerned residents and the Princeton Regional Health Department’s health officer approached the Borough and Township about putting together regulatory measures for potentially dangerous dogs, it appears that a community task force will meet within the next few weeks to discuss how to offset dog-related attacks. Bill Foran was looking to make a statement as the Princeton University football team hit the field at undefeated Lafayette last Saturday and he wasn’t alone in that regard among the Tigers. Tina Bortz will never forget the final goal of her freshman season with the Princeton University field hockey team. Kyle DeBlois made life miserable last fall for opponents of the Princeton High boys’ soccer team with his dashing play in the midfield. The adventure now contained inside the first floor exhibition room at Princeton University’s Firestone Library is there to be enjoyed and explored for only three more weeks. Curated by John Delaney, “To the Mountains of the Moon: Mapping African Exploration, 15411880” is a fascinating show. Don’t miss it. You have until October 21. Richard Greenberg’s The Violet Hour is about a young publisher, John Pace Seavering, and two writers, Denis McCleary and Jessie Brewster, who desperately want to be published. The year is 1919. The Great War has just ended. The Jazz Age is about to begin.